Pulled a Gottlieb Sky Jump out of my storage unit that's been there awhile. I'm going to sell it at Pinfest and wanted to see if it worked. I haven't touched an EM repair wise in 15 years. I buzzed all the fuses and they are good. On 1st start up it reset the score and then the score motor kept running. I shut it off and reset the start relay. Game now will start and spit out a ball. Nothing however will score on the PF and the flippers won't work. Ideas anyone? clean up all the jones plugs with a scotch brite pad. plug em back in and see what changes. Good idea. I did that and now it won't spit out a ball...lol. It's just dirty. You may need to take some time to clean off the score motor contacts and the trough switch. There are probably dirty contacts throughout. Best thing for an EM is to use it every so often. How far does it get in the reset sequence. Does the Start (S) relay activate when you press the Replay button? Thank you. Yes, the start relay will activate when I start a game. After that nothing. All lights are lit. The next thing that should happen after the S relay is the Reset Completed (A) relay should activate. The motor should start running with the S relay and continue until the other coil on the Reset Completed (AR) relay activates. Can you tell the difference in wire colors on the A and AR coils? A has a Green&Yellow wire, and AR has a Yellow&Blue wire. The A will activate. In the picture the switch plate will move upwards and then down to that position. I have no idea what you're trying to say here. Make it easy for us to help you! I don't think he knows that's an interlock relay. The next thing that should happen after the S relay is the Reset Completed (A) relay should activate. The motor should start running with the S relay and continue until the other coil on the Reset Completed (AR) relay activates. After the S relay, the A relay activates and then nothing else happens. 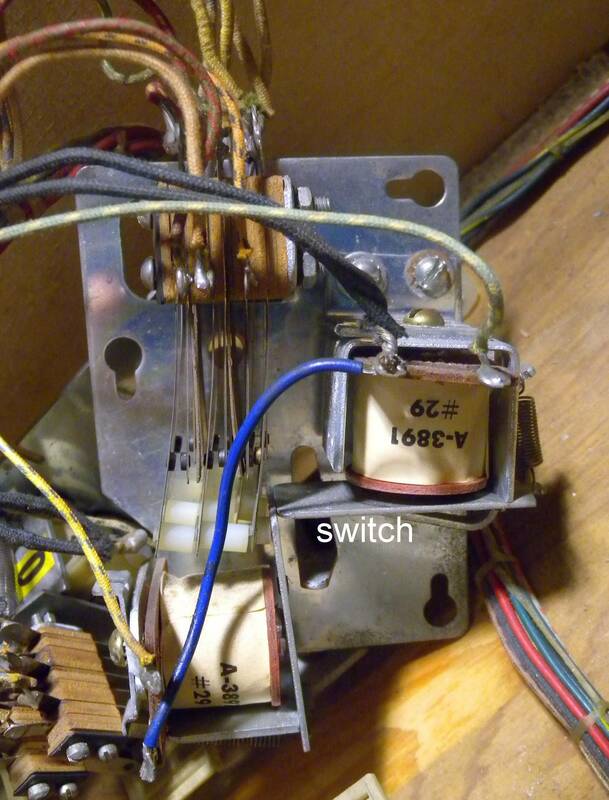 Have a look at this switch to see why the A relay doesn't run the motor. I cleaned that switch and now after it 1st activates the score motor runs several seconds. Then A relay activates again the motor stops. I understand that to mean that the AR coil on the Reset Completed relay activates about when the motor stops. S should reset the Sequence Bank and Target Bank. If you need a phone call PM me some contact information. Yeah, I don't think cleaning jones plugs qualifies under a "shotgun" approach to fixing a game. Really, you can't screw up jones plugs unless you break wires off or plug them back in wrong. Obviously S is activating if the score reels are resetting. No problem. If you have a better plan, I invite you to help him by saying what it is. OK, a few things you neglected to mention. Is the target bank resetting? Is the rollover sequence resetting? And finally, when the ball would be sent to the shooter lane, was the ball count unit stepping up? The reset sequence of this game is not particularly complex. If the ball count unit doesn't step up, you won't get any scoring and the flippers will not work. If everything is resetting and the ball is not shooting up to the shooter lane, check the outhole switch, the outhole relay, and the associated motor switch for the outhole relay. If you can't find that I'll dig out my schematic and help you. If everything resets properly and you get the ball to the shooter lane, then check the adjustment and clean the trough switch, and also check and clean the ball count unit in the head. I concur that the main problem here is more than likely it's just dirty and the switches are corroded by it sitting as long as it did. Like cars, EMs want to be played and generally don't take really well to sitting around for long periods of time, especially if it's been in a non climate controlled storage unit. The ball count unit was the issue, working now. Thanks Howard for all your help!